The Singing Bowls that June and Rob offer are sourced from Nepal. These bowls are hand hammered and are made by a local family in Katmandu, Nepal. The bowls emit a pure bell-like sound, which can vary depending on the style of wand used to play the bowl and also the size of the bowl. The wands are made of hard woods or a softer woods such as aspen. Suede covered wands are also available which create a lovely gentle sound. A variety of bowls are available. These include plain bowls, etched bowls of different designs and some bowls that have a dappled effect on them. All of the bowls create beautiful sounds and come complete with a suede covered wand and a cushion. 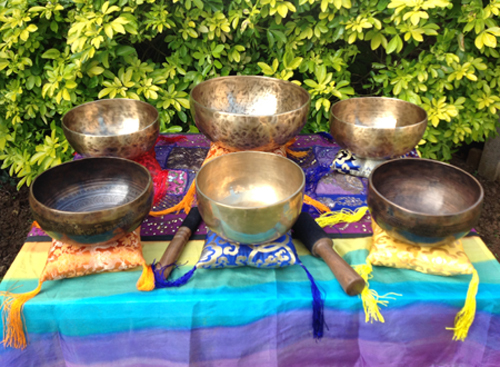 Himalayan Bowls are a great tool for use in sound healing. They are very versatile, creating many wonderful tones when played. They can also be tapped by using a variety of wands. For More Information on Himalayan Bowls, visit the ReikiSounds website or contact June and Rob by email or phone on 01525 753866.